New York City has cornered the market on winter icons: skaters circling beneath the gigantic Christmas tree in Rockefeller Center, shoppers bustling through crowded department stores, and lighted buildings and store windows illuminating a dark, cold night. December is when Manhattan shows off the best it has to offer, and millions of tourists flock to the city to take part in the winter fun. December is not the cheapest time to visit the Big Apple—hotel rates are the highest of the year—and the weather can be cold and gray. But, the crowds and the crisp air add to the festive atmosphere, and with so many activities to choose from, you can always find something that’s reasonably priced. Whether for a weekend or a week, a December getaway in New York City can offer something for everyone. Why New York City in December? Throughout December, New York City celebrates the winter season. Each year, the Rockettes put on the Annual Radio City Christmas Spectacular, complete with signature kick lines. The New York City Ballet performs the holiday favorite The Nutcracker at Lincoln Center throughout the month, and you can find holiday concerts everywhere from Carnegie Hall to local churches. Plus, the regular theater season continues with plenty of Broadway and off-Broadway options. Many out-of-towners come to New York for the pre-holiday shopping. From Fifth Avenue to SoHo and everywhere in between, there are presents to be bought and bargains to be found. The holiday markets at Grand Central Terminal, Bryant Park, and Union Square turn up unique and handmade gift items, but disappear when December does. Plus, Saks Fifth Avenue, Macy’s Herald Square, Lord & Taylor, and Bloomingdale’s bring new meaning to window shopping with their fantastic holiday window displays. Crowds line up around the block to view these free attractions, but smart shoppers know that the lines get shorter after the stores close each night. Other popular December activities include ice skating at Rockefeller Center and posing for photographs beneath the enormous decorated Christmas tree. 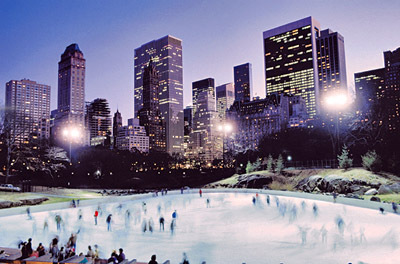 For cheaper ice time that’s equally scenic, Central Park offers two rinks—Wollman Rink and Lasker Rink. And don’t forget New York’s famous New Year’s Eve party in Times Square on December 31. Getting to New York City doesn’t need to eat through your travel budget, especially if you live on the East Coast. Three airports—JFK, LaGuardia, and Newark—serve New York City, so if fares are high at your first-choice airport, try another. JetBlue has also recently begun service out of Newark and expanded its JFK service, with fares as low as $40 each way between Boston and JFK. To get the lowest fare possible, try flying at off-peak times, such as midweek, early in the morning, or late in the evening. For holiday travel, you’ll find cheaper fares by avoiding the peak travel days and flying on December 19, 25, and 31. For a truly cheap ride, various Chinatown bus companies offer service between New York City and Boston, Philadelphia, Washington, D.C., and Atlanta, with prices starting at just $12 one-way. Activity costs don’t have to add up, either. Admiring department store windows and strolling through Central Park are always free. For $53 per adult, a New York City Pass provides admission to six Big Apple attractions, saving you over $50. Bus and subway riders can show their MetroCards to get discounts in Chinatown, and a ticket stub from the Rockette’s Christmas Spectacular or Peter Pan gets you access to buy-one-get-one-free offers at close to 100 hotels, restaurants, museums, and shops. For discount theater tickets, stop by the TKTS booth in Times Square for 25 to 50 percent off same-day shows. For more information on planning a December trip to New York City, visit SmarterTravel.com’s new New York City Travel Guide or the city’s official tourism website. Manhattan’s high energy and limitless attractions are guaranteed to pull you out of the winter doldrums and put you in a festive frame of mind.